Meet Joni, one of our travel experts for French Polynesia. Born in the Southwest, raised in the Northwest, I have called the South Pacific home for nearly 25 years. I founded J2 Travels in the late 1990s to share our knowledge with other like minded travelers – remembering always, that the joy is in the journey. I currently live on Maui, I'm endorsed by IATA, and am a member of the Fiji, Tahiti and New Zealand Tourism Boards. "I want to say a big THANK YOU!! We had the most amazing time on our trip. Everything was wonderful. We absolutely loved Queenstown. We took the bus out to Milford Sound and then took a helicopter back as you suggested. It was raining the whole way out there but then the rain disappeared so we saw so many waterfalls it was breathtaking! We also went horseback riding in Glenorchy (well, I did – Pete got sick!) and that was amazing. The drive out there was beautiful and the ride itself was really fun. We tried to go skydiving but unfortunately it cancelled twice because of the winds. We also went jetboating,and spent a lot of time in the restaurants and bars in town. We then spent a few hours in Nelson and went out to Bleinhem for a day and did some wine-tasting, which was a lot of fun. When we were in Motueka we spent sometime relaxing and then did an 8 hour kayak/hike through Abel Tasman, which was truly amazing…and tiring! We spent a lot of our time in Rotorua just hanging out at the hotel and relaxing because it was just so beautiful, but we did go to hell’s gate which was really neat. In Auckland we spent a day walking around and then played golf one day. We also went to dinner at the Mudbrick restaurant in Waiheke which was great. And on to Fiji...it was amazing! We loved Tokoriki. It was a beautiful spot and the Fijian people that worked there were so warm and friendly. The honeymoon bure that we stayed in was absolutely amazing, and we spent a lot of time just hanging out in our plunge pool. We also went snorkeling a few times, which was great. The food was also really good. As for the seaweed, there was definitely a fair bit of seaweed around and a slight smell of it, but it really wasn’t a big problem. After the first day we didn’t even think about it. I would definitely recommend Tokoriki to others, and would love to go back someday. Thank you again for all of your help. We will definitely let our friends and family know how great you were when they head off to NZ / Fiji! " "We had a fantastic time in Fiji. Qamea was particularly wonderful-rustic, authentic, beautiful, and communal. Staff members were incredibly friendly and always very accommodating. Namale was spectacular and definitely more upscale. Our bure was so elegant and we had a private deck overlooking the ocean that was phenomenal. We appreciated the remoteness and feel of Qamea over Namale, however, so we were delighted to have been there longer. I would certainly recommend Qamea to anyone traveling to that area of the world. Thanks again for arranging this remarkable trip. It was incredibly unique and one we will remember always. We're both grateful to you. " "The Four Seasons Maui and your recommendations for the other island resorts we visited were wonderful. The Four Seasons Maui is impeccable, as we also enjoyed the Halekulani on Oahu and the Hyatt at Poipu on Kauai. Thank you so much for your attention to detail, your availability every step of the way planning our honeymoon and assisting our guests. Your surprise gifts to us and our guests were extra special touches, and I can't rave enough about you. Even through the most stressful times I endured, you always kept your calm and made sure we were taken care of. You went above and beyond for us, going to the Four Seasons to take pictures of the construction before we got there for the wedding so we would be prepared, calling around to local stores to help me find items for gift baskets, giving us the scoop on where to shop, eat, etc.-all in such great detail as well! You really are a true, experienced travel agent that doesn't just book trips, but travels to and knows the areas and resorts in which you book your clients and you become a trusted friend. It is with the utmost gratitude we write this in appreciation for everything you did to help make our honeymoon dreams come true for us and our guests. " "We are now home and slowly acclimating to reality. We had the most fabulous time on our holiday and want to thank you for seeing to it that every little detail was well planned, organized, and executed. We feel you really listened to our desires and planned "THE PERFECT" holiday...thank you so very much. We will definitely call you again and have recommended you to several of our friends. It is obvious that you really know both New Zealand and Fiji as I'm sure you know the other locations you book for your clients, I especially liked how you found locations that were less "touristy" and more reflective of the countries we were visiting...just as I requested. Thank you!" "Kurstan and I had the most amazing time on our trip to Maui. The wedding went off without a hitch, even though when we arrived at the house that we rented for the occasion there were hurricane strength winds. They died down in just enough time to get the flower circle in a perfect place overlooking the ocean and everything went according to plan. The ceremony was thoughtful and such a happy time for us as well as Kurstan's mom and Jack who seemed pleased with the arrangements as well. As for the honeymoon, that was a vacation of a lifetime. I have never been as happy as I was on this trip. The hotel was lovely and the service was fantastic. Our room was more spacious than I imagined and the view was breathtaking. The hotel itself was beautiful from the lounges to the restaurants to the pool area to the beach. The beach was the best that we saw on the island. Also, Joni, you were so helpful in getting everything arranged with us and Kurstan's mom. It was difficult for us not having ever been to Maui figuring out where to stay and what to do, but you were more than helpful in making this a trip that will be remembered throughout our lives. What a way to start a marriage! And, thank you for the champagne you sent to our room upon our arrival. It was such a great way to start our trip. Thank you so much for everything, and we'll definitely contact you for any help we need with travel in the future. " "Lisa and I had a magical experience at Qamea and everything was wonderful! You prepared us perfectly and all the details were worry free. We had a beautiful sunny day outdoor wedding in Michigan and then whisked away to paradise. Thank you does not fully communicate our appreciation and we will be sending you referrals at every opportunity. We will be in touch soon and again, sincere thanks and warm regards! " Formerly known as the Huahine Te Tiare Beach Resort, this resort is a place where you can slip into a different world, a different culture, where you are sure to meet new and interesting people--a place to be surrounded by a calmness that you might only dream about. "Garden Island". Each bungalow provides modern comfort in a Polynesian atmosphere. Complimentary activities include scheduled boat transfers to and from the main town of Fare, snorkeling, kayak and outrigger canoe paddling, table tennis, beach volley and local cultural activities. Other activities include: botanical garden and vanilla plantation visits, picnic and circle island tour by canoe, horse back riding, sunset cruises, deep sea fishing, scuba diving, surf transfers as well as car, scooter, motor dinghy and bicycle rentals. 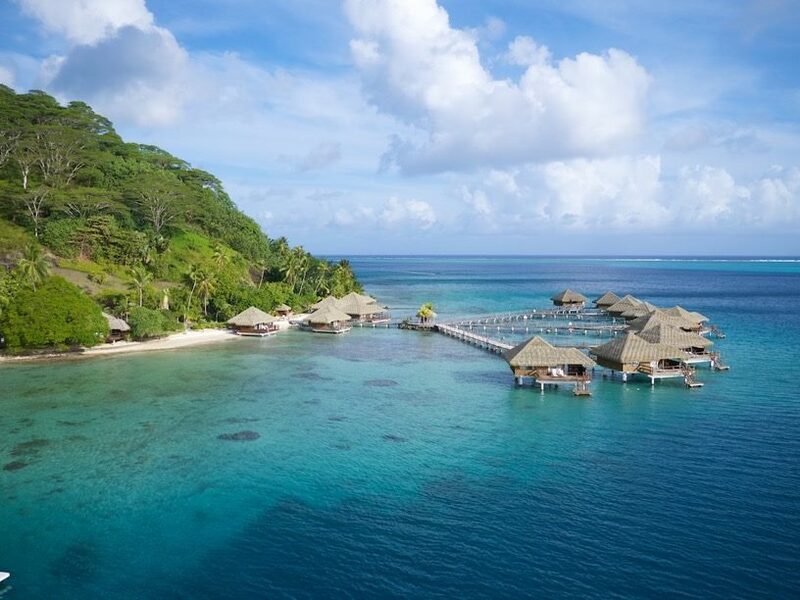 Pros: From one of my clients, who stayed at Ninamu and Royal Huahine: "The Royal Huahine was a bit more private and had more amenities, but also had less opportunity for socializing. The rooms had A/C, a hot water kettle & mini-fridge. There is a supermarket in town to stock up on supplies if you don't want to have every meal at the restaurant. Some guests complained that it was lonely, but I found it restful. They had 4 boats a day into town, and you could schedule extra boats to go early for diving. I whole-heartedly recommend Mahana Dive. Other divers preferred it to the other dive shop on the island. Annie, the owner, speaks English and is committed to small groups and dive safety. She and her dive captain, Robert (an American) are great resources for things to do on the island. I brought my own dive gear but would use her rental gear if I were to visit again in order to save traveling weight. She had good quality weight-integrated BCDs and short wetsuits. Most diving was in the Pass, and on some days there was a fair amount of current. They did not use reef hooks, so dive gloves would be helpful. We saw lots of sharks, eagle rays, turtles and large schools of jacks. There were a few trips to areas with more coral, but most of the diving seemed to be about the pelagics.". Cons: Isolated from town (could also be considered a plus! ), required boat to get to town, most of staff French/Tahitian speaking only with exception of front reception staff who spoke excellent English.